The One Direction fans that filled BC Place Stadium on Friday night have no idea what they missed. But the Rush fans who filled Rogers Arena sure do. 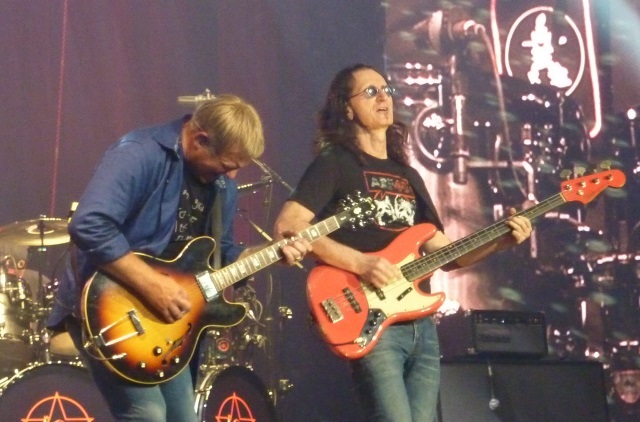 Now on the tail-end of their R40, and possibly final tour, celebrating 40 years, Rush played the remaining scheduled date in their home country stopping off in Vancouver, BC and played a 23 song, nearly three hour long set delighting old and young fans (who didn’t go across the street) with a strong setlist featuring a whole bunch of older songs but quite a few newer ones too. 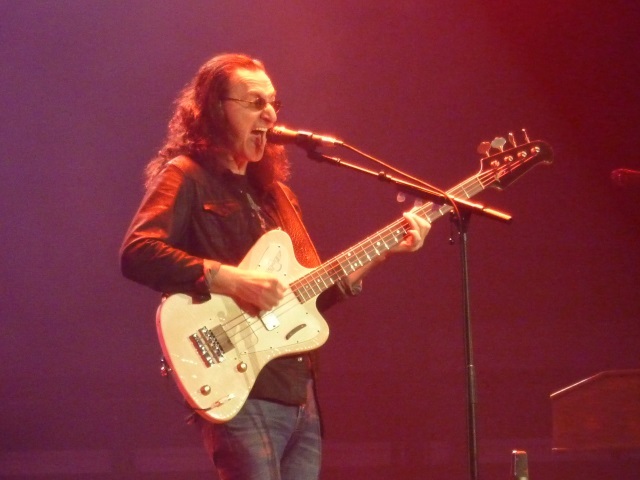 By now, whether it’s your first introduction to what the tour comprises or you already know what’s literally going on behind the scenes, Rush is stepping back in time ticking off a song or two from their albums along the way. Meanwhile, stage hands quietly slip on stage and begin removing props that the dedicated fan base knows represents different tours. Not present on this night Test for Echo, Presto, Hold Your Fire and Power Windows, the latter album getting serious stage time a few years ago on the Clockwork Angels tour. But the rest of their 15 studio albums (not counting the covers album Feedback) stretching back to 1974 all got the live treatment for at least one song. Representing the 1990s, just two songs, the bass heavy “Animate” off Counterparts and the fun title track off Roll the Bones. Rush simply rocked out to “Distant Early Warning” one of the finest rock songs of the 1980s that just doesn’t get much radio play for some reason. Then it was what everyone was waiting for. The rumors were confirmed weeks ago. But what night(s) would the song so many thought should have been played on the last tour that featured a string ensemble? Tonight was one. Famed violinist, fellow Canadian and resident of Vancouver, Ben Mink appeared and one of Rush’s most emotionally driven songs came to life. “Losing It” never played before this tour completed the evening and the show wasn’t even half over. Long ago Rush’s reputation for their dedication to and remaking so accurately live the songs on their albums helped build their rapid following. This performance proved why. It’s an interesting song to bring to what’s billed as a final large tour. Much speculation has arisen about Rush’s future. 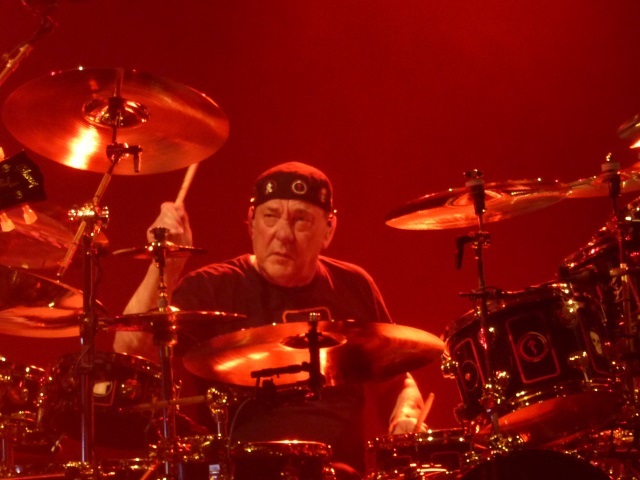 Singer and bassist Geddy Lee, drummer Neil Peart and Lifeson are now in their early 60s but are far from losing it. Fans and critics agreed, for once, embracing their latest, Clockwork Angels, and the band is playing just as strong as they did during the Snakes and Arrows tour perhaps the pinnacle of their career when it was noted that Lee was not simply singing but performing. No longer is Lee’s higher range vocals a concern as far as the longevity of the band. He hit all the high notes and even managed to raise the bar reaching back to his 70s register when he sounded like the damned howling in Hades. Though he certainly was stretching his limits on “Lakeside Park” which sounded a bit raw as did “Anthem” but then he brought it home for the 41 year old “What You’re Doing” and “Working Man” all four in that order, for the encore, ended the night. However, it’s Lifeson who hardly plays like some managing arthritis but indeed it’s this ailment that even Lee believes could ultimately end the band. He’s been dealing with it now for 10 years and it’s progressed into his feet but you wouldn’t know it as he carried around double-neck guitars on “Xanadu” playing one of the best openings to a rock song ever recorded. His blistering solo on “Working Man” yes at the end of three-hours of playing is what should make Eric Clapton want to burn his guitar. The “Cygnus” medley comprising portions of Cygnus X-1 and Cygnus X-1 Book and incorporating a Peart drum solo followed, then “Closer to the Heart,” “Xanadu” (combined technically half of A Farewell to Kings!) and finally the song that in many respects started it all, 2112, closed out the second set with the band playing four of the song’s seven “suites” with another shredding solo by Lifeson to close it out. There were a few flubs on the night though unless you were in the rows closest to the stage you’d probably never know it. 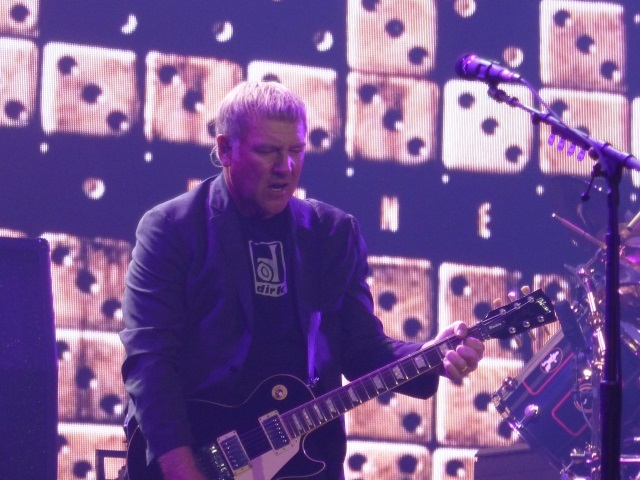 The opening to “Roll the Bones” was a bit rough so was “Distant Early Warning” and there was an obvious issue with Lifeson’s guitar on “Jacob’s Ladder” as he was clearly agitated trying to get something working and got a bit of technical assistance. The song sounded in order, but once the problem was fixed the missing chords were very apparent. All quite easily overlooked considering these three control all the sounds coming through the speakers. It was an evening of mastery. Three musicians who, along with a lot of natural talent , put in a lot of hard work, refined their craft and established one of the longest running careers in rock history. A stark difference to the manufactured pop that was happening just a stone’s throw away.